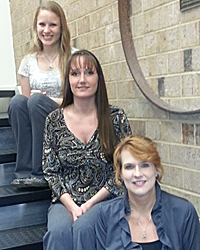 From top: Heather Mackie, Cyndi Kinley and Susan Chester. They came to Mickey with experience as school teachers, stay-at-home Moms, and insurance agents. At varying times during their working lives they sold jewelry and kept the books for a local family-owned restaurant. Susan even worked at a Mission in Mexico. None of them ever worked for a global manufacturer of specialized truck bodies and trailers, and that doesn’t seem to matter. When she returned to the U.S., Susan worked as an Industrial Staffing Consultant before joining Mickey’s van body team, and also filled in on the company’s front desk from time to time. Since 2011 she’s been the full-time Accounts Payable Clerk on the accounting team. Heather joined Mickey in 2013 after stints selling insurance and jewelry, and working as a preschool teacher. She started as a Receptionist and helped out with invoicing, and since last November has been working full-time in Payroll/HR.